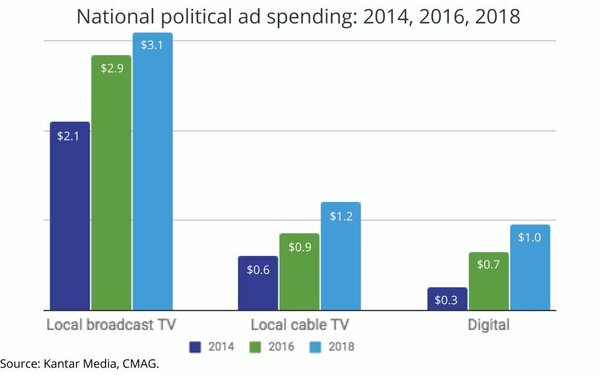 The official numbers are in, and according to WPP competitive ad-tracking units Kantar Media and its CMAG political media specialty division, the 2018 campaign ad spending set new bars for both broadcast TV and digital media. The chart above shows how each sector -- local broadcast TV, local cable TV and digital -- have grown between 2014 and 2018, rounded up to the nearest decimal point. In total, those Big 3 political media totaled $5.25 billion in spending during the 2018 midterm elections, up 20% from 2016's presidential election year, and up 78% from 2014's midterms. According to Kantar's analysis, the spending advantage shifted from Republican dominance to Democrats in 2018. "Democrats had a 53/46 edge in spending in 2018," the competitive ad researcher found, noting: "In 2010, Republicans led spending by a 54/45 margin fueled by negative sentiment towards the Affordable Care Act; in 2014, Republicans more narrowly led spending by a 51/47 margin." Healthcare, in fact, emerged as a central issue again in 2018, but this time to the Democrats' advantage. "Ads supporting Democratic candidates referenced healthcare a staggering 1,000,000 times," Kantar notes. "Republican ads referencing health care came in at a more modest 367,000. 49% of all ads for Democrats referenced health care. For ads specifically targeted to House races, that jumps to 59%." 1 comment about "Midterm Political Ad Tally: $5.25 Billion, Advantage Shifted To Democrats". Ovais Malik from New Journey Travels, January 5, 2019 at 6:51 a.m.